Remember this cardigan? I got it prior to my Asia trip and it’s made such a versatile basic! I wore it on the plane on the way there and back, and since I’ve returned have been pairing it with jeans or leggings and boots for an everyday casual outfit. I wore it here with a lighter color palette if you need some additional inspo… I always get chilly sitting at the computer, so it’s perfect for throwing on over whatever I’ve got on that day – way better looking than my old Theta fleece, am I right? This cardigan is now on sale, and while it’s still not what anyone would call inexpensive, it’s worth the investment. I can’t wait to transition it into spring with white jeans and cute sneakers! Speaking of kate spade new york, have you check out their new arrivals lately? So many covetable pieces! This season they have achieved the perfect balance between femininity and sophistication. In past seasons, there are usually items in the collections that are just too girly or young-looking for me, but I’m crushing on pretty much everything in Spring ’17! There are a bunch of work-to-weekend dresses you need to have on your radar, like this scallop tweed number, this swing dress, and this ruffle shift. If you can dress a little more trendy at your office, I’m loving this contrasting daisy lace look too. For a ladylike separate, check out this scallop sweater! On the accessories front, you won’t want to miss these heels, this clutch and these earrings. Before you sign off for the weekend, don’t forget to subscribe to my newsletter! I launched a brand new exclusive series on Wednesday called Splurge or Save?, featuring my favorite trends, investment pieces and classic wardrobe staples with budget-friendly alternatives. You’ll also get access to my weekend reading list every Friday, the Beck and Call Q&A series every Sunday, and more amazing exclusive content! Click here to subscribe today! I can definitely see how you can get a lot of uses with that cardigan. I haven’t checked out Kate Spade yet, but now I definitely will! Omg I love that cardigan! 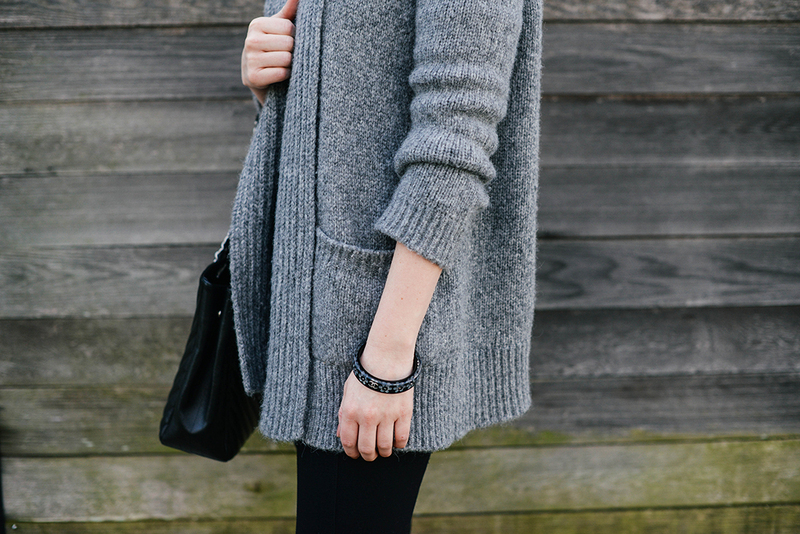 The perfect cardigan for sure! I love it with the leggings and those sleek boots.